GrowNYC's Clothing Collection: 8:00 a.m. to 1:00 p.m.
GrowNYC's Food Scrap Composting: 8:00 a.m. to 1:00 p.m.
A lively farmers market--located at 3rd Avenue and E. Fordham Road, adjacent to a bustling transit hub and Fordham University--the Fordham Greenmarket will serve Bronx residents, commuters, area workers, and students, faculty, and staff at the university. This weekday market will offer a terrific array of fresh, locally-grown produce and tasty baked goods. 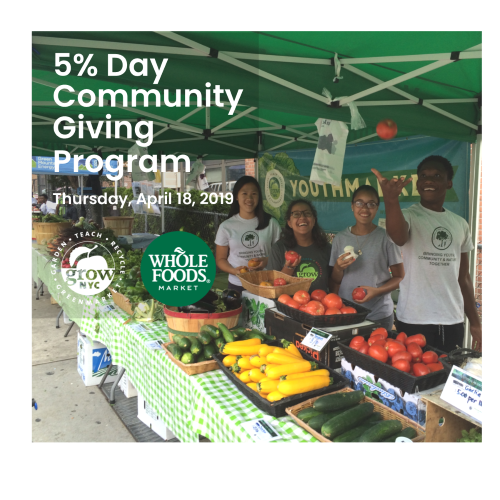 The Fordham Greenmarket will also host free community activities, as well as nutrition education and cooking demonstrations conducted by the Department of Mental Health and Hygiene’s Stellar Markets program, further enhancing an amicable neighborhood rapport. From July 6th until September 28th, Cornell Cooperative Extension will conduct weekly bilingual nutrition education workshops and cooking demonstrations at this market. Visit their stand each week to learn how to choose and store fresh produce, and nutritious preparations to try at home!